This is gearing up to be a fun and exciting weekend with Sierra Nevada Beer Camp right around the corner. The New England edition has 119 brewers coming and tickets are still available. Notwithstanding the quantity of beer available on Friday night at Beer Camp, we know that our tasting room visitors are going to want to try some great beers too. We have extended hours on Thursday, 12-6p, will be closed Friday for Beer Camp, and then our normal hours on Saturday (12-6p) and Sunday (12-4p). This weekend, we will have a new installment in our Infusion Series on tap for our friends, as well as several other specials. Before getting into that, I need to say a special THANK YOU to Cynthia from Middle Intervale Farm for providing us with the basil for last week’s infusion. It was a big hit. This week, we decided to try something new. A few weeks ago, Joel and Christie had a chance to a try several ciders from Far From the Tree and were very impressed. However, the one that really piqued their interest was the tea and lemon infused cider. Black tea is something I grew up drinking. My grandmother was a big fan of black tea, and that was a trait she passed on to her daughters and grandchildren. Under her roof, a proper family meal had not finished its appropriate arc without everyone clearing the plates, and big pots of strong black tea being shared at the dinner table. For me, it has always felt like the appropriate end to a great meal. Also, all summer, my mother kept big pitchers of strong iced tea dosed with handfuls of mint or several slices of lemon for good measure in the fridge for us to enjoy. As Joel was telling me about the flavors of the cider, those memories from my childhood crept up in my head, and it was clearly something we had to try for the infusion series. So with a tip of the cap to our neighbors in Mass, and a big thank you to my grandmother Florence and my mother Irene, we decided to give this a try. 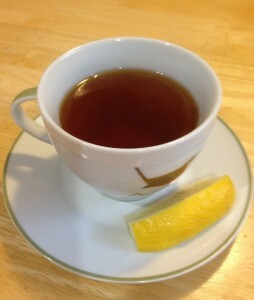 For this infusion we used loose leaf Irish Breakfast Tea combined with fresh lemon zest. We hope you enjoy. Since we know this is going to be a very exciting weekend with the Sierra Nevada Beer Camp in town, we decided to also prepare some of our ginger infused saison as well. What can we say, the ginger with our house yeast just works, and remains a very heavily requested infusion from our regulars. We also have two hops varieties that were asking to be tried as a single dry hop. The first is the classic Tettnanger hop. One of the “noble” hops, their spicy character was a natural for us to use. The second is an Australian hop called Topaz. So far, we have had great fun with the Australian hops, and decided we should give this beauty a try as well. We will be rotating these four beers through the tasting room this weekend in conjunction with Eddy, Blaze, and Wanderlust. We hope you get a chance to come in and give them a try, and have a great weekend!